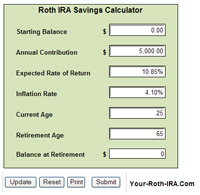 Use the Roth IRA calculators below to generate estimates for any number of questions regarding your retirement savings. Simply browse the list below to find the calculator you need to answer your retirement savings questions. 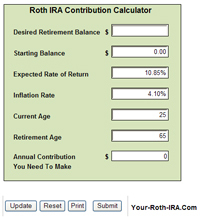 Use this calculator to estimate your Roth IRA balance once you reach retirement age. And it will calculate your future retirement balance. 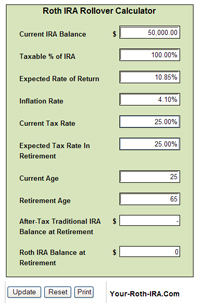 Use this calculator compare your retirement savings under two different scenarios - one in which you convert your Traditional IRA (or 401k) to a Roth and one in which you don't convert. 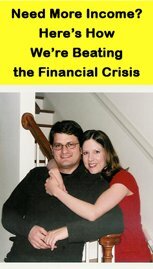 And it will calculate your inflation-adjusted after-tax Traditional IRA retirement balance relative to your inflation-adjusted tax-free converted Roth IRA retirement balance. 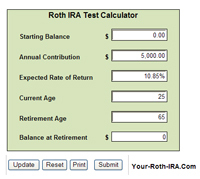 Use this calculator to compare your Roth IRA to your Traditional IRA so you can find out which one you should contribute to. And it will calculate your projected Roth IRA and Traditional IRA balances. 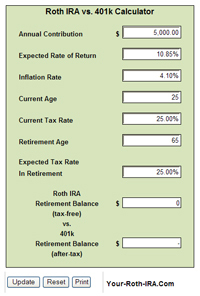 Use this calculator to compare your Roth IRA to your 401k so you can find out which one you should contribute to. And it will calculate your projected Roth IRA and 401k balances. Use this calculator to determine the size of the annual contribution you need to make to your Roth IRA in order to meet your retirement savings goals. And it will calculate the size of the annual contribution you must make to meet your retirement goal. 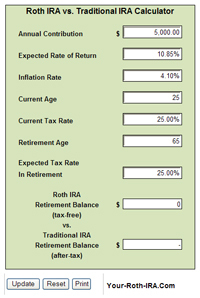 Use this calculator to estimate your Roth IRA balance when you reach retirement age - adjusted to inflation. And it will calculate the inflation-adjusted value of your account at retirement. 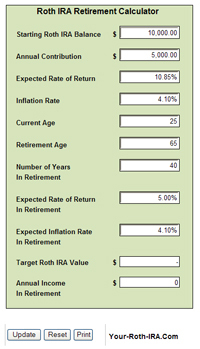 Use this calculator to estimate to annual compound rate of return you need to generate on your retirement savings in order to meet your retirement savings goals. And it will calculate the rate of return you need to generate on your savings in order to meet your retirement goal. 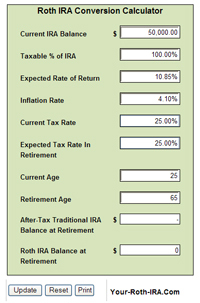 Use this calculator to estimate the annual inflation-adjusted income your Roth IRA will yield after you reach retirement age. And it will calculate your annual inflation-adjusted income in retirement. You can then compare that figure to your projected income needs to assist in your retirement planning. 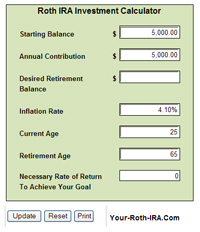 Use this calculator compare your retirement savings under two different scenarios - one in which you rollover your Traditional IRA (or 401k) to a Roth and one in which you don't. And it will calculate your inflation-adjusted after-tax Traditional IRA retirement balance relative to your inflation-adjusted tax-free Roth IRA rollover retirement balance. We feel confident these are some of the best Roth IRA calculators on the web, providing you with invaluable tools for designing your Roth IRA retirement savings plan.